Mariam Bawardi was born in Ibillin in 1846, and became an orphan at two. As a teen age domestic worker, she survived having her throat cut, asserting that it was a vision of the Virgin Mary that saved her life. She became a Carmelite Sister and in her short life had many visions, and established a Carmelite Mission in India and a Monastery in Bethlehem. She was Beatified in 1983, and canonized later. There are about 10,000 Catholic Saints, so it is the rare that a small village has a saint of it s own. This has been the week that she has been thoroughly adored and celebrated in the town of her birth. We woke up on Tuesday to learn that there would be no school on Wednesday. This was not a surprise, since the school calendar is not even well known to the teachers. 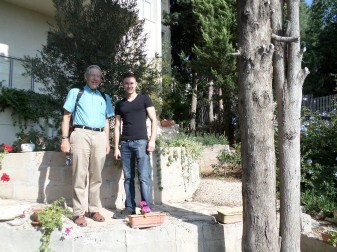 We made impromtu plans to visit Nazareth, hitching a ride with Richard, a maintenance - security worker who lives there, and notifying a guest house in Nazareth that we were coming. 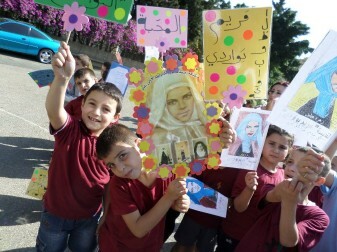 At noon, however, pictures of Mariam began to appear, and there were organized classes of elementary and middle school students with balloons and posters marching to the main parking lot. 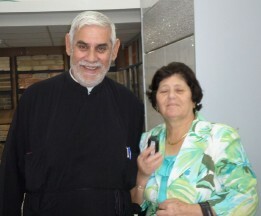 That is how we learned that Wednesday was the anniversary of Mariam's Beatification. As quickly as the children had assembled, they all headed home for the holiday. At about 3 pm Richard picked us up and drove us to Nazareth. Getting there took about twenty minutes, but getting through to city and down the narrow streets took another 15. 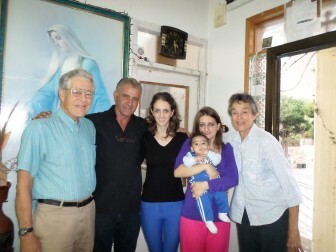 We found the Abuna Faraj Guesthouse closed and empty, so Richard took us to his house for a pleasant visit until we could make contact at the guesthouse Here is a picture of Richard, and part of his family including a grandchild. Next to it is a picture of a house near his. We notice how houses seem to go up floor by floor as the family extends. Even a three-story building will have a flat roof with rebar extending our of the lower supporting joiats ready for the next floor. this house, wiith its tiled roof, appears to be finished. We did eventually reach the Abuna Faraj Guesthouse, and met Sister Martha Bertsch, who, at the urging of Abuna Chacour, renovated the building and now runs it. Sister Martha is a Carmelite Nun originally from Austria. She told us the story of the building. Six years ago it was something of a derelict - an abandoned part of the high school next door. 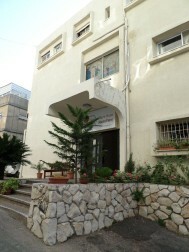 It is a substantial 3 floor building with several rooms on each floor. When she first entered it, the first floor was repairable, but the second floor, with many broken windows, had become a home for the pigeons. It took a long time to move those tenants out, and did not always find smooth going in having the rooms finished to her satisfaction. Her standards were very high, as we learned during our stay. 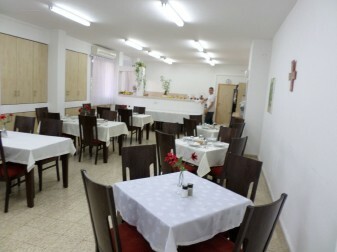 The guest house can house groups of thirty or more, in very comfortable and well-appointed rooms. She and her staff (mostly volunteers, like us) serve breakfast and dinner - both meals bountiful and delicious. 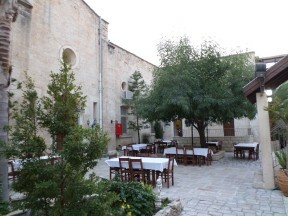 The guesthouse is about 3/4 mile from the Church of the Assumption, and other well known sites. We enjoyed our overnight at the Guest House, both eating and sleeping well. 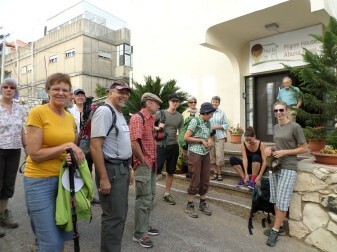 We shared the accommodations with a group of Pilgrims from Sweden and Switzerland who were hiking through the Holy Land. They were good hikers, but did have a sag wagon carrying their luggage. They were very "Christian", making it hard for a Quakerly Unitarian (Q - U) to keep up the conversation. In the morning we watched the Pilgrims start on their way, and then, after a walk in the garden, set out for the center of the city with John, a 20-year-old Austrian Volunteer. 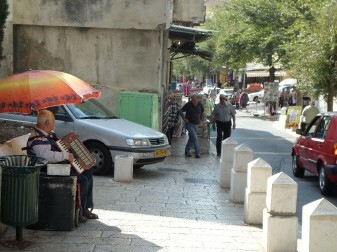 Though we did not enter any Holy Sites, we did find an accordion player which was just as good. He was seeking tips from passing groups by playing music from their country of origin as they walked by. We pointed out that John was Austrian, and he broke into The Skater's Waltz - to which Ruth and I waltzed. We hope some time to receive the photo John took of the occasion. We spent most of our time in a bizarre establishment opposite the C of A that is devoted to The Virgin Mary. It is a multi-floored building starting from archeological digs at the foundation and ending with a beautiful chapel opening onto the C of A. In between is a multiroom, multiscreen presentation going from Genesis 1 to the end of the Gospels. 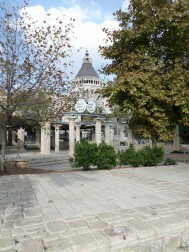 The excavated house foundations near the entrance could actually have been there during Jesus' early life. We finished our day with a walk through the Souk, or Market, or Bazaar, and a climb through the narrow streets and alleys above the city center, before seeking out bus 343 to Ibillin. The bus ride was easy, and we returned at about 4 to a quiet and empty campus. At 5:00 church bells began to ring, and we noticed a few cars leaving off people in the parking lot. As darkness fell the lot grew very active, with three drum and bugle corps warming up, and vendors selling food and LED flashing rods. We followed a growing number into the Church of the Beatitudes. As we walked down the central aisle we noticed that many people seemed to be turning to look at us, that is, behind us. 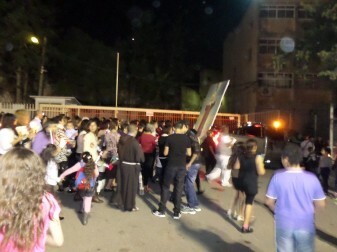 We took two seats, just as a substantial procession of candle bearers, cross bearers, priests, and the Archbishop (Abuna Chacour) followed right after us. Classes resumed on Thursday, but the physics class I was to attend was cancelled because of an assembly. Then on Friday, supposedly a day of no classes, I did attend a physics lab on Snell's Law. It was done with half - moon plate glass pieces on a rotating table with a diode laser as a light source. This was one of the first labs for this class (I think they were 11th graders in their first physics course. they will take physics for two years. I recalled that Snell's Law was the first physics lab I did in high school, and we did it with square pieces of glass and pins. The results, in either case are n = 1.5 or so. Not all the period was taken with the experiment. The lab had a "smart board", that is a projected display controlled by a computer that allows the teacher to use it like a chalk board, or project anything from the internet on the board. Touching the board at the right place is the equivalent of clicking a mouse. Fadi, the teacher, was quick and well organized, and interspersed the expeiment with interesting displays and videos of fiber-optic applications. The students were eager, attentive, and got down to work efficiently (especially the girls) The class was 10 boys and six girls (the labs are done half a class at a time). The lab groups were not mixed. The class reminded me of my stint in Bogota, and the teacher said that this is one of the best classes he has taught. We set out in the afternoon to trace roads on the west side of the town, but ran into the spectacle of seeing a couple of tall palm trees being cut down. It turned out that one of the maintenance men at the school, Alah, was involved and he invited us to sit on his porch and watch. Then we were served drinks and cookies. I can only report that they tied a rope around the tree and pulled it down expertly in a narrow space between a power line and a house. Saturday was a school day, and Ruth was back with her elementary school students in the library. We are working on setting up emails between American students and those at MEEI. We have some fourth to sixth grade contacts from the Richmond Friends School, and we will proceed with that during th week. In the afternoon we sort of completed the walk from the day before, and circled differently into town, so that now we can direct a person to the schools from any entry. No way is easy, however; every way involves a narrow street and a steep hill. Sunday we had another surprise. 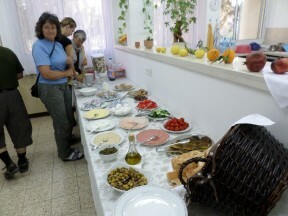 A certain Abuna Masoud called us and invited us to Nazareth. One of his sons is married to Nancy who is a neice of Ibrahim Bisharat, one of our favorite friends in Whitefish. 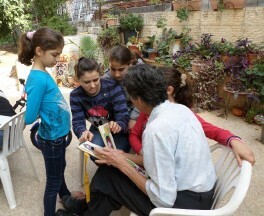 At 11:30 Abuna Masoud and his wife picked us up at Ibillin and drove us to his home in Yaffa, a suburb of Nazareth. As he drove in he pointed out the various homes and businesses of members of the Bisharat family. There must be hundreds! At his house we met more of his family including Nancy, her husband and three children. As usual, Ruth had the Brownie book there to facilitate the conversation. 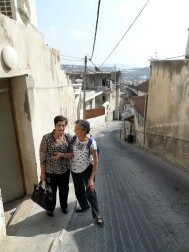 Then we were driven up to Nazareth Ilit (Upper Nazareth) to meet another part of Ibrahim's family. 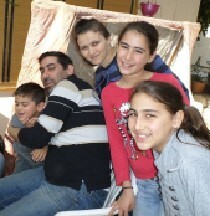 This was his nephew Wadji, and his family. 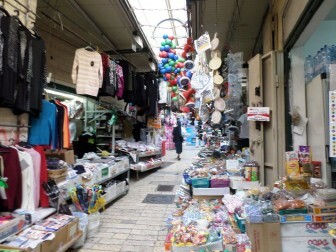 "Old" Nazareth, the one tourists visit, is a mainly Arab and mainly Muslim city. 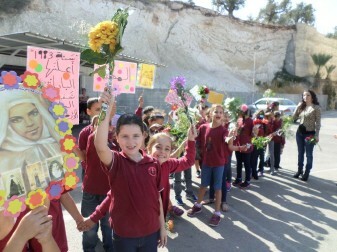 In 1948 it was not touched by the Israeli forces, even though many villages were destroyed in the neighborhood. Instead, Israel built a new city for Jews on a mountain to the east of the old city. 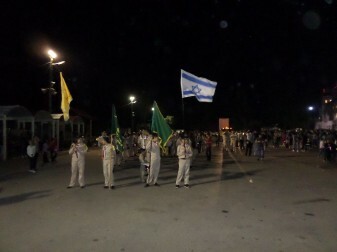 Once you enter Nazareth Illit, the Israeli flag is prominent, there are parks with lawns, and, we are told, schools only for Jewish children. 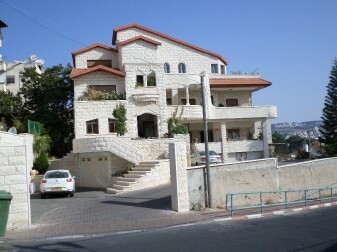 Because the old city is getting very crowded, about 10,000 Arabs, mainly secular professionals, have moved up from old Nazareth and make up nearly 20 percent of the population of Nazaret Illit. 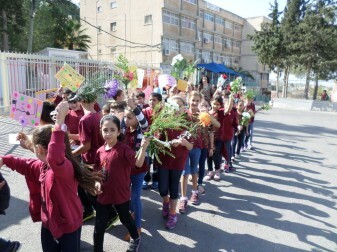 There appears to be some conflict in the city on a political level - Jewish and Arab neighbors seem to get along well - but items like the establishment of Arab schools are contentious issues. To give readers more information on the situation there I have provided a recent article from Haaretz titled Fear and loathing in Upper Nazareth at this link. 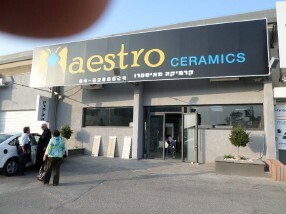 We went to what we think is the North-Eastern side of Nazareth Illit, past a McDonalds, to a sort of warehouse area, and then into the display area of a very modern kitchen and bathroom equipment business. There we met Wagdi, who quickly referred to his Uncle Ibrahim in Montana. His establishment was sparklingly new, and we walked through it as he entertained some customers and his Russian speaking assistant worked with some others. 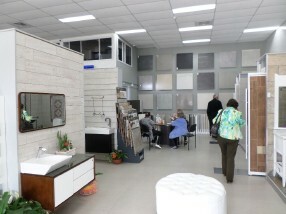 It seems that he sells fixtures, sinks, cabinets, toilets, counter tops, floors, tiles - everything that would go into a bathroom or kitchen, and installs them as well. The shop looks so new because it has only been open for two weeks. He is the youngest of two generations of Bisharat kitchen-bathroom dealers in Yaffa, and, as youngest brothers often do, wants to start off on his own. Wagdi then invited us to a restaurant near by, run by Palestinians (or Arabs) which he has often patronized in the past as he worked day and night to open his business. 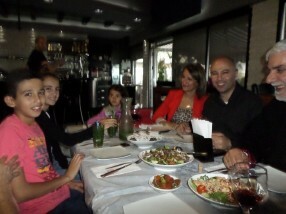 We were treated to a amazingly sumptious meal, in the company of Father Masoud and his wite Sade, Wadji, his wife Rula, and their three children, Sama, Razi, and Shahd. 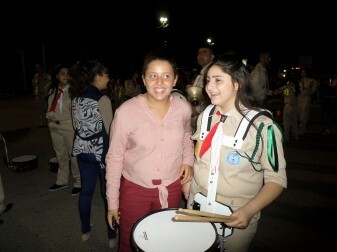 The oldest, Sama, is thirteen and captain of her tennis team. We thought we should connect her in some way with our grandchild in Whitefish, 13-year-old, tennis - playing Eric. By the end of the meal the sun was already low, It was clear that Wagdi had business concerns, and Father Masoud had to leave quickly to provide transportation for another part of his family. With some effort we convinced Wagdii and his wife that they did not need to drive us all the way to Ibillin, as they insisted. We compromised by letting Rula drive us to our old haunt from two years ago - the Sister Margaret Hostel, high above the Church of the Annunciation. 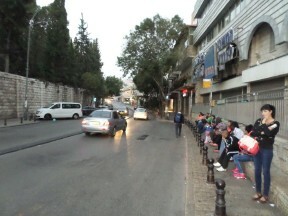 We walked back down the narrow paths to the central bus stop, and caught the 343 home at 5 pm at dusk. It was an easy ride, The bus was ten minutes early, and the driver let us off right at the entry to the school.